When Acai bowls hit the scene a year or so ago, I knew I had to give one a go! The perfect healthy morning treat, they are so easy to make and can be switched up to suit you. 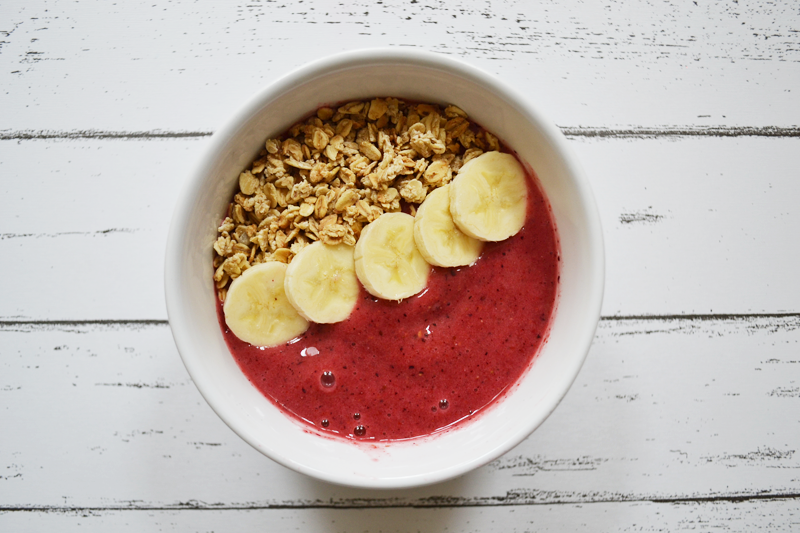 This was my first attempt at an Acai bowl, or smoothie bowl – not sure if there’s a difference?! Handful of granola for topping. The best thing about these bowls is you can literally get whatever you want and just chuck it in the blender, and you’re good to go. This tasted delicious and was so refreshing, I can see it being the perfect summer snack!! You don’t necessarily need to use frozen fruit but I’d definitely reccomend it, it helps make the smoothie extra thick and filling. At the moment I’m loving strawberry and banana, I think next time I’m going to pop in some oats for added texture too! Have you ever tried these? What are your favourite flavours and toppings?